Campaigns & Elections listed their Colorado influencers for 2011 with Suthers, McNulty and Anschutz top Republicans and Hickenlooper, Hughes and Gill top Democrats. I was listed for my calling the election night races first on KOA and more recently on Channel 9. More of the races seem to be close these days and go later into the night – or maybe I’m just older. Champagne mangos have arrived in Denver. The picture is a display of Ciruli Brothers Produce Champagne mangos at the front entrance of Whole Foods in Cherry Creek. Ciruli Brothers Produce began in Pueblo, Colorado in the early 1940s. It had warehouses and sheds throughout southern Colorado, Denver and Phoenix in the 1950s and 1960s. Charlie (Chuck) Ciruli and his sons now run the firm out of Tubac, Arizona, north of Nogales, Mexico, where most winter produce and fruits for American tables come from. Chuck Ciruli is currently in Denver. He is my cousin (I’m in the photo), and the two of us will attend a birthday party for a 90-year-old family matriarch – Helen Mosco – in Pueblo on April 3. 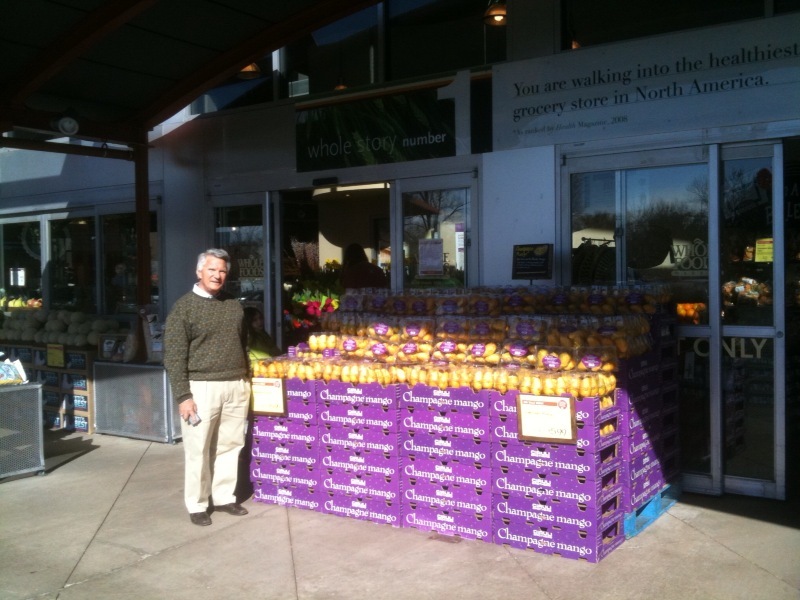 Champagne mangos are a specialty of Ciruli Brothers Produce and they distribute them through Whole Foods and other quality food retailers throughout the west. The Denver Post’s analysis of the positions of Denver mayor candidates on education reform put Michael Hancock and Chris Romer in the top position. Carol Boigon had more of a hands-off approach and Doug Linkhart seemed to shy away due to union aspects. James Mejia, who knows education from his school board and early childcare experiences, frames the reform issues along the lines of the reform opponents who claim minority representation is insufficient. The Denver metro area continues to have slightly more than half (55%) of the state’s population. It has historically been the state’s population hub (54% in 1960). The region’s growth rate of 16 percent the last decade was one percent below the state average of 17 percent. The state’s other regions had slightly higher growth rates, but not enough to challenge the metro area’s dominance – the South (18%) and North (28%) Front Ranges and along the I-70 corridor on the Western Slope (20%). • The South Metro area gained the most people during the first decade of the new century. More than half of Arapahoe’s growth, which paced the state (17% growth in both state and county), was in Aurora, and more than half of the city’s population is Hispanic, black and Asian Pacific Islanders. • Although Denver’s growth of 45,000 (8%) was less than the regional average, it represents the city’s continued vitality. Denver has increased by 133,000 residents since the 1990 census (28% increase). Also, along with being an arrival city, much of the growth was from metro residents moving into the city from the suburbs to be close to a vibrant city center and to reduce transportation burdens. • Douglas County growth slowed dramatically at the end of the decade due to the weak economy, causing a major housing bust. Adams County and the north suburbs began a slower, but steadier growth trend in its western suburbs and in smaller cities and towns in the north. The county has more room to grow into good transportation access and considerable water. • Boulder County lost Broomfield during the decade as the city became an independent city and county. Boulder’s anti-growth policies were successful as the county had the smallest population increase in the area– 3,277 residents (1%). • Jefferson County has had little growth since the mid-1990s when it appeared to be surging to become the state’s largest county. Now, it has fallen behind Arapahoe County by 40,000 residents. Two of its largest cities – Lakewood and Wheat Ridge – lost residents. Colorado grew by more than 700,000 people since 2000, and it was mostly distributed along the Front Range. Eighty-two percent of Colorado’s population is spread along the Front Range, with more than two-thirds of it in the six-county metro area. The North Front Range has about a tenth of the state’s population, with Weld County growing by 40 percent (state’s second fastest with 71,889 new residents). The South Metro area of El Paso and Pueblo counties have 16 percent of the state’s population, with most of it in the Colorado Springs area, which grew by 105,000, helped by a growing military presence. Within the Denver Metro area, the north and south suburbs continue to grow rapidly (Douglas County held the state record of a 62% increase), and the area’s core city, Denver, added 45,000 residents. There were a number of counties on the Eastern Slope that lost population the last 10 years, whereas the Western Slope had many counties with large increases, most along the I-70 corridor. A full-scale labor war is less likely in Colorado than Wisconsin. Colorado is a modified right-to-work state with low levels of private sector unionization. That is not to say business activists and labor leaders would not try to change the balance of power in Colorado if they had a chance. Rather, the partisan balance at the State Capitol makes legislation weakening or strengthening the respective positions of labor and business unlikely. Labor wars broke out in 2007 when Democrats took over the governorship and had majorities in both houses of the legislature. Although the short-term impact was to strengthen state employee unionization, the ultimate effect was to contribute to Gov. Bill Ritter’s political troubles and launch an expensive ballot war in 2008 over right-to-work, which left the state’s labor/business balance of power unchanged. Although conservatives would like to challenge public sector unions, especially the teachers union, at the moment cutting K-12 budgets is harming the teachers union more than changes in collective bargaining could. Anti-union interests are also benefiting from the well established, including among liberal urban Democrats, school reform movement with its preference for independent charter schools and hostility to teacher seniority and job protection rules. The most aggressive manifestation of the momentum of the reform movement is a voucher system’s recent boost in Douglas County. Because of the ease of access to the Colorado ballot, the battle over the size and expense of the state’s public sector will likely be waged around questions of new taxes in 2011. But, creative political operatives will likely think up new measures for voters to consider if not this year, then 2012. Questions related to the political influence and the budgeting impact of the public sector will likely dominate this decade as the recession throws public revenue and expenditures in sharp relief. Voting for a $10,000 pay raise four weeks out of the start of the Denver mayor’s race was a risky act ($5,000 for council members). Although it was not a surprise Doug Linkhart would support it, one of the City Council’s strongest liberals, it caused a major controversy in Councilman Michael Hancock’s campaign. Hancock, a smart and usually careful politician, who was running a strong second in the mayoral money race, caused a firestorm of criticism within his campaign and provided his opponents considerable ammunition for the final weeks of the campaigning and the runoff if he should make it. The salary issue became a needed reprieve for mayoral campaign watchers from a mostly lackluster and issueless race. How Hancock handles the issue may decide if he remains a leading candidate. The top six candidates for mayor of Denver had their answers down to two minutes on a full range of topics at the DAC/Petroleum Club forum on March 2. They all had spent considerable time thinking about economic development and had the most passion for fixing education – both topics where Denver mayors have only a few small carrots and sticks. Where they actually could make a difference, such as in police personnel or procedures or the structure of Denver’s revenue and spending, they were more cautious and less animated. But, one of six will be mayor, and the top four or five will receive 90 percent of the vote. Ten candidates made the ballot. So, unfortunately, for the next month, many forums will be filled with pleasant, but irrelevant, conversation from several candidates with a few supporters, but no chance. Can one of these candidates win the election on May 3 without a runoff? If the race is measured by money, Romer accumulated more than twice the amount of any other candidate in February. But money will likely only get him into a frontrunner position, not necessarily the fourth floor. And, being the frontrunner makes Romer the leading target for the next two months. The main message from the recent Denver Post/9 News sponsored effort to have interested citizens balance a budget is that they can’t make any cuts of significance. Their most enthusiastic choice was for a steeply graduated billion dollar plus increase in the state income tax. After a 40-minute exercise in using hand-held polling devises, the assembled audience, populated with a high percentage of liberal interest groups and media types, cut $100,000,000 out of the state’s billion-dollar deficit and mostly ignored the Governor’s recommendations, for example, for a quarter billion dollar cut in K-12 spending. However, this audience is not much different than the public at large in their reluctance to cut anything they value for reasons of social equality, sympathy or pure self-interest. Repeated national polls show the public wants a balanced budget and claims to prefer cuts over higher taxes and borrowing, but refuses to endorse any serious reductions in entitlements or defense, and likes the concept of taxing high-income individuals or profitable corporations. The latest Gallup poll on state budget balancing shows the public claims to prefer balancing the budget with cuts, not taxes or borrowing. But, if given a list of items that reducing will make the biggest impact – Social Security and Medicare – voters cringe and can’t do it. Notice the Wisconsin scenario of limiting bargaining rights of state employee unions is very polarizing. As the two members of the Colorado Joint Budget Committee said, they don’t have a choice. They must balance the budget by May. And, they can’t raise taxes without a vote of the public. But, that couldn’t take place until November, and if passed, wouldn’t start to take effect until 2012. The latest Gallup poll shows President Barack Obama with a 46 percent approval rating, down from his recent high of 50 percent when he gave the State of the Union. A rating below 50 percent is considered threatening for a re-election. This blog assumes the national race will be won by just a couple of points, and smart campaigns will likely make the difference, along with the direction of the unemployment rate later in early 2012. In a recent multi-state survey for anti-gun advocates, bipartisan pollsters tested Obama’s favorability in Arizona and Colorado. While favorability is different than job approval, and Obama is better liked than his performance is approved, it is still useful to go into a re-election with a positive favorability rating. Colorado’s registered voters are about five points more positive than Arizona’s. The same survey showed Arizona Senator Jon Kyl with 46 percent favorability (a Republican who just announced he would not seek re-election) and Colorado Democratic senators Mark Udall and Michael Bennet with a 45 percent and 47 percent favorability rating, respectively. The lower ratings than Obama’s was largely a reflection that about one-quarter of the population could not rate their senators. Their positive-to-negative ratio was more than 20 points and better than Obama’s. The combined candidates in the Denver mayor’s race raised more than $2 million the first two months of the year. Fundraising frontrunner Chris Romer raised a third of it and more than doubled all other candidates in his February haul ($252,000). Romer remains the frontrunner. City Council members Michael Hancock and Carol Boigon are in a close race for second place in fundraising. James Mejia had a weak February and needs to step up the pace if he wants to have the funds for an April advertising campaign. Doug Linkhart and Theresa Spahn, although crossing the $100,000 threshold, are not yet viable in the money race. The Denver Post publisher Dean Singleton said last week that he greatly admired James Mejia. Is that a hint of an endorsement? The Denver Post endorsement should boost a candidate’s name identification and fundraising clout. In fact, assuming there will be a runoff, which is likely given the number of candidates representing various constituencies, the Denver Post’s endorsement could put one of the non-frontrunners in the June 7 election. If it went to Chris Romer, he could win without a runoff. Denver Mayoral Election – Will There Be Vision? The election of the next mayor of Denver is as important as the election of the Colorado governor. Denver’s mayor, working with the region’s political and civic leadership, can, if they have the vision and leadership skills, help develop and design the key projects and programs that drive the region’s economy and quality of life improvements in the next decade. Only the Denver mayor has the visibility and resources to promote both Denver and regional agendas, many of which will constitute the largest infrastructure projects in the state. The Denver airport was the state’s largest construction project for half a decade, and still constitutes a major source of construction activity and is a huge economic generator. Denver has been fortunate to have a series of high-quality mayors who have helped maintain the city’s leading position in the metro area and state. After several years of population decline, like most older cities surrounded by growing suburbs, Denver began to reverse the trend after the 1990 census. As of the latest count, the city has continued to add population and retain its first position in the region. Equally important, the city has maintained its economic vitality. Regional sales tax figures show Denver collected 30 percent of the sales tax in 1989 and receives 29 percent today. An amazing feat given the population and business growth in the suburbs and the comparative track record of core cities in other metro areas around the country. Denver’s modern mayors – Federico Pena, Wellington Webb and John Hickenlooper – helped create a civic momentum that has kept the city and region progressing. Denver also had a civic and business leadership willing to join with political leaders to make investments in civic improvements that have maintained the city’s economic vitality and quality of life. Pena started a flurry of plans and new projects in 1983 that laid the groundwork for 30 years of growth – a new convention center, new expanded airport, development of retail nodes on Broadway, Highlands and other sites, the baseball stadium, and LoDo investments, just cite a slice of one of Denver’s most productive decades in its history. Webb got the airport opened in 1995, focused on in-fill in the newly opened up Stapleton and Lowry sites, promoted the sports venues Invesco Field and the Pepsi Center, and dedicated considerable passion to development of the Platte River Valley and its lower downtown connections. Hickenlooper continued the investments as he began his two terms with a new justice center and half a billion dollars in bonds for improvements throughout the city. But, Hickenlooper added a regional perspective working with the suburbs on joint economic development projects, transit and water solutions. Thus far, the 2011 mayoral candidates have lacked much in the way of vision and investment strategies. They feel Denver’s possibilities are constrained with a deep recession and multiple years of $100 million deficits. And, indeed, structural fiscal reform is the top priority. But, 1985 was an economic low point as Denver began its long climb to its revenue and two decades of growth. Before the end of February, four U.S. Senate seats had come into play in western swing states – three with retirements (Kyl, Ensign and Bingaman) giving the Republicans a fresh start. Among the twelve states in the West, five are presidential battlegrounds and all, but Colorado, will have serious U.S. Senate contests. • In Arizona, Sen. Jon Kyl just announced his retirement. Although Republicans have the advantage, with the right Democratic candidate and a far-right Republican primary winner, the race should be competitive. • Montana’s Sen. Jon Tester will have a serious battle with the state’s only Republican congressman. Tester’s centrist philosophy is probably a good fit for the state, but he irritates New York and D.C. liberals and some special interests who may not offer him much support. • Scandal plagued Sen. John Ensign has resigned, giving Republicans a fresh start. But, a bitter primary could leave a wounded Republican nominee. Democrats now have a stronger chance if they can find a top candidate. • The retirement of popular and low-key Sen. Jeff Bingaman gives the Republicans an opportunity to mount a competitive campaign in New Mexico. Bingaman had been seen as a shoe-in. The presidential race will be the dominant 2012 election with Obama looking to win three of the five swing western states and at least being competitive in the other two – New Mexico, Colorado and Nevada are at the top of the President’s list; Arizona and Montana are next. 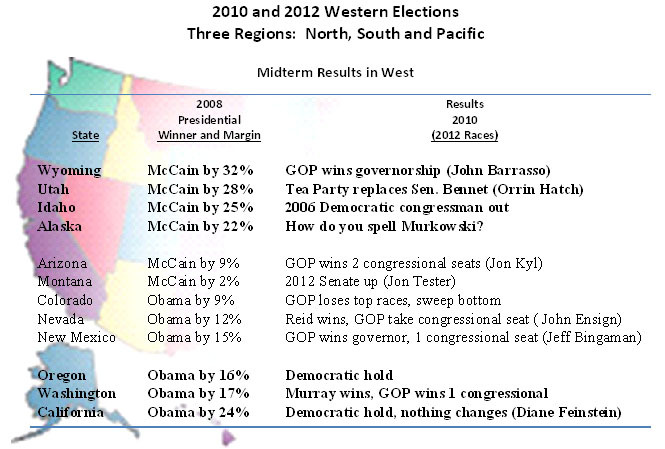 The four senate seats are in the middle and most competitive tier of western states. The other senate races should re-elect incumbents or members of the same party – Wyoming (John Barrasso, R) and California (Diane Feinstein, D). Only Utah might be interesting due to Sen. Orrin Hatch having to navigate the Tea Party in a very constricted primary system. While Hatch is conservative by any indicator, he has been in the Senate a long time. Last spring, the Utah Tea Party refused to re-nominate Republican Sen. Bob Bennett. Washington State will likely have a governor’s race due to Democrat Chris Gregoire not running again. Democrats hold the advantage. But the capstone state this year may be Montana because not only of a competitive U.S. Senate race, but Democrats must find a replacement for term-limited Gov. Brian Schweitzer. Already four Republicans have indicated they want to run. Democrats have a couple of political candidates, but advantage is Republicans. The latest Gallup polls confirm that, in spite of President Obama’s improved approval rating, the 2012 election will most likely be very close and depend on the strengths and vulnerabilities of the Republican candidate and the quality of the two campaigns. One factor driving a likely close race is polarization. It is exceedingly difficult for a president to win any significant opposing party supporters. As the two parties have become more ideologically homogenous in the modern, post-Reagan era, polarization has increased. Obama begins with little approval from Republicans, but has support from four-fifths of Democrats. G.W. Bush had some residual post 9/11 Democratic support as he began his campaign in 2003 (it was also before he launched war in Iraq), but he finished office with a record high approval gap. While Republican candidates begin early jockeying for position, the Democrats are engaged in an internal debate between Chicago and D.C. staffs and consultants. Did the 2010 midterm show that the re-election will be a closely fought battle in swing states with large numbers of independent voters and weak partisans or is the fight through the heartland based on turn out among traditional Democratic core constituents? David Axelrod cites the former as his model and labels it the Colorado Plan. The Michael Bennet two-point senate win last November is his vision of the most likely 2012 scenario. Although many of the party’s old hands and especially its traditional labor, big city and coastal constituencies agree that the battle will be close, especially if a sluggish economy doesn’t motivate the party base, they disagree victory is in weak partisan swing states. They feel a full partisan battle aimed at the heartland – Ohio, Michigan, Wisconsin and Pennsylvania – is the best strategy. They believe states that performed especially poorly for Democrats in the midterm must be turned around. The latest re-election figures offer support for each view. 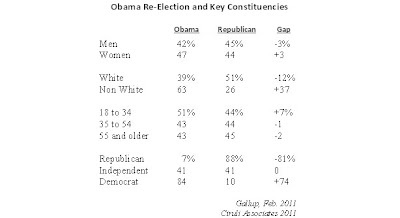 As of February 5, 2011, Obama was in a dead heat with a generic Republican (45% to 45%). As the campaign begins, there is very little gender gap, an area Democrats will change if they use the Colorado model. Democrats continue to lose the White vote and carry substantial minorities. They also have a small advantage with Americans under 35 years old. It is not clear young voters and minorities will turn out above average in 2012 to provide the extra need to balance out older voters and Anglos. Axelrod would point to the 41 percent to 41 percent tie between Obama and a generic Republican among independent voters to show that the race is in the middle, not the partisan edges. Labor and liberals would argue more Democrats, young and minorities are the key. Keep the message on the left. Although the two strategies are not mutually exclusive, the resolution of the debate will direct resources, and it will greatly affect Obama’s overall positioning, his message selection, tone and legislative strategy starting now. The 2010 census data for congressional districts has been released. Republican Front Range seats tend to have a surplus of residents, which need to be distributed. Coffman, Lamborn and Gardner have extra votes and DeGette, Perlmutter and Tipton need population. Polis is in the only Democratic seat that has a surplus. The Sixth CD has sufficient population to add a State House seat, which will mostly be centered in Douglas County. Now, we all wait to see the result. • The Egyptian revolution began January 25, on a day set aside to remember an Arab police revolt against British colonial rule, and ended on February 11, the day after Hosni Mubarak’s disastrous February 10 speech. The Tunisian government fell 11 days earlier on January 14. So, in less than thirty days, two regimes fell. Egypt’s only took 18 days. • The Egyptian and Tunisian activists who most fueled the revolutions were part of a pan-Arab youth movement mostly born after 1990 and the wars and regime changes that shaped the current Middle East politics. In Egypt, the last major confrontation was a general strike in April 2008. The antecedents of the young organizers had been working on the effort for six years, but much of their work was hidden on the blogosphere. • The younger children of old dictators appear more out of touch than their fathers. Gamal Mubarak encouraged his father’s slow and unresponsive hard line, including his fatal final speech. Saif al-Islam Gadhafi’s defense of his father’s regime is as bizarre as most of Moammar al-Gadhafi’s speeches. He took the lead in declaring women and children would die if Libyans didn’t bend to the will of his father. • Ideas related to nonviolent, youth organizations, use of social networks and modern marketing techniques were imported, shared and infused into the youth organizations. From Serbian youth activists’ success stories to reclusive American political scientist Gene Sharp’s nonviolent theories, Arab youth borrowed, studied and argued best practices. Their nonviolent resistance undermined the legitimacy of the War on Terror techniques that old regimes were using to suppress their own oppositions. Another effective display of the asymmetry of warfare. • The revolution brought many grievances and groups in Egyptian society together. Mr. Ghonim was most motivated by police brutality, and featured it on his website, “We are all Khalid Said” – the victim of a police beating. Some working and lower class participants were motivated by the poverty and lack of opportunity and others in the educated classes by the class conscience from a socialist perspective. The dislike and primitiveness of state-run media was a factor as was the general resentment of the corruption and privilege of the ruling class. And, of course, the Muslim Brotherhood was a late player looking for its place. • Mubarak was gone as soon as he became the one thing all the protests and protestors could agree on – from corruption, to no jobs, to anti-American and anti-Israeli sentiment, to police brutality – all complaints converged on wanting Mubarak out. Of course, it helped that he played his limited hand so poorly and that there was one institution available to fill the void without stifling the promise of reform – the army. • The events, which produced the most drama and best visuals – the five-hour battle for the Kasr-el-Nil Bridge on January 28 and the Mubarak supporters’ counterattacks on January 29 in Tahrir Square – helped the protesters and hurt the regime. The thugs helped de-legitimize the regime as the protestors remained undefeated, but mostly nonviolent. The thugs also finally activated youth elements of the very disciplined Muslim Brotherhood to weigh in. • In the fast moving national crisis nearby regional powers, such as Saudi Arabia, Israel and Iran, and great powers, such as the U.S. and Britain, were mostly observers. Saudi Arabia and Israel preferred stability and current arrangements. The U.S. wanted a peaceful and measured transition. At various times, the U.S. appeared to be on the side of both the revolution and the establishment. In the end, events took over and the transition was abrupt, but at least for now, stable with some known players (the army), but not a clear process.